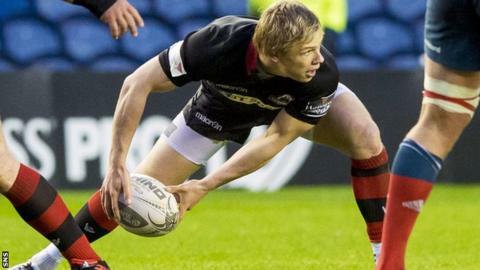 Edinburgh have signed scrum half Nathan Fowles and lock Alex Toolis on new contracts. Fowles, who joined the club on loan in February, has signed a deal tying him to the European Challenge Cup finalists until May 2016. Toolis has committed for a further season. "I've really enjoyed my time here so far, they're a good bunch of lads, great backroom staff and Edinburgh's an ambitious club," said Fowles. Fowles had been brought in from Sale Sharks to cover injury and players being called up to the international side for the Six Nations, and only made his first start in the 34-3 defeat to Munster earlier this month. He said: "Starting against Munster has been a highpoint - I know the result didn't go our way - but it was nice to get that first start and get into my game a little bit more. "Obviously the Cup semi final was great and I felt really privileged to be part of it. A lot of lads have worked really hard to get us to that point and it would be great to be involved in the final, which is going to be a massive occasion." Toolis, along with brother Ben, became the first set of twins to start for the club at lock.